Erin Bradley Designs: End of the Year Sale! Take 20% off, Starting Now! End of the Year Sale! Take 20% off, Starting Now! I hope everyone is having a great holiday week! How about a little end of the year sale to make things a smidge sweeter? 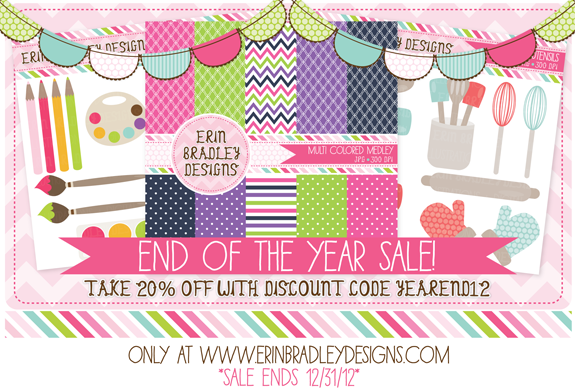 Starting now and good through December 31, 2012 you can take 20% off at www.erinbradleydesigns.com with the discount code YEAREND12. This discount code can be used in addition to the Buy 3, Get 1 Free promo that is already on the website for $5 personal & commercial use (credit required) graphics. Now is the time to stock up on graphics & goodies for the new year! If you are looking for graphic design/branding items for your shop don't forget I am also offering 25% off orders of $25 or more on my graphic design website, www.inkobsessiondesigns.com, with the discount code of HOLIDAY12.